Anyone else patiently awaiting the arrival of spring, despite what the calendar says? It got cold again over the weekend here in west Texas, and I haven’t been able to find a single stalk of rhubarb anywhere I go. I’m praying for spring fruit and temperatures soon! At least we can make it feel like spring on our plates, right? 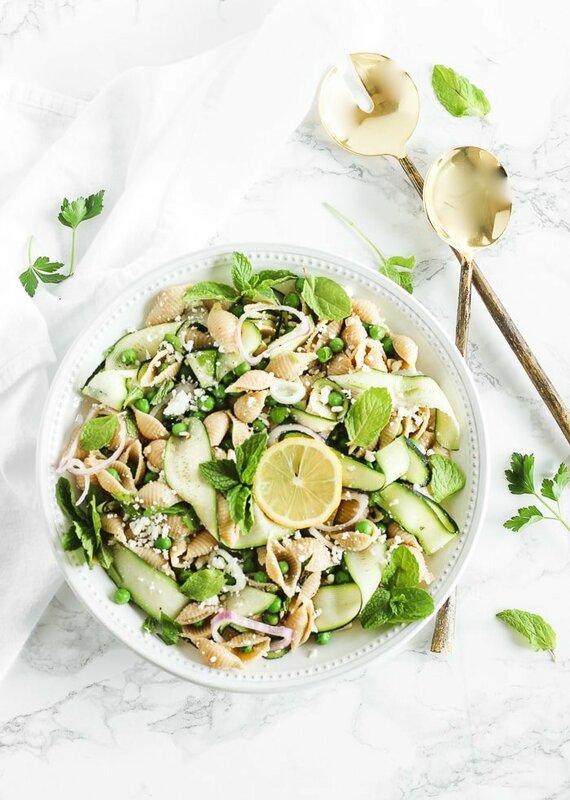 This spring pea and zucchini pasta salad brings you all of the light, fresh flavors of spring without any rare spring-only ingredients that have yet to pop up on supermarket shelves. It’s just the recipe to brighten up your dinner table as you wait for warmer weather and grilling season! Mr. Table is a huge fan of pasta salad. Of course, he’s accustomed to the creamy kind that may or may not have bacon in it. So when he saw that I was putting mint and lemon in this pasta salad, he was skeptical. But as soon as he tried it, he loved it. 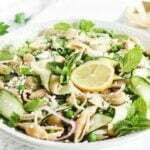 The freshness of the herbs and lemon juice with zucchini ribbons and peas makes this healthy spring pea and zucchini pasta salad so light and perfect for warmer weather. 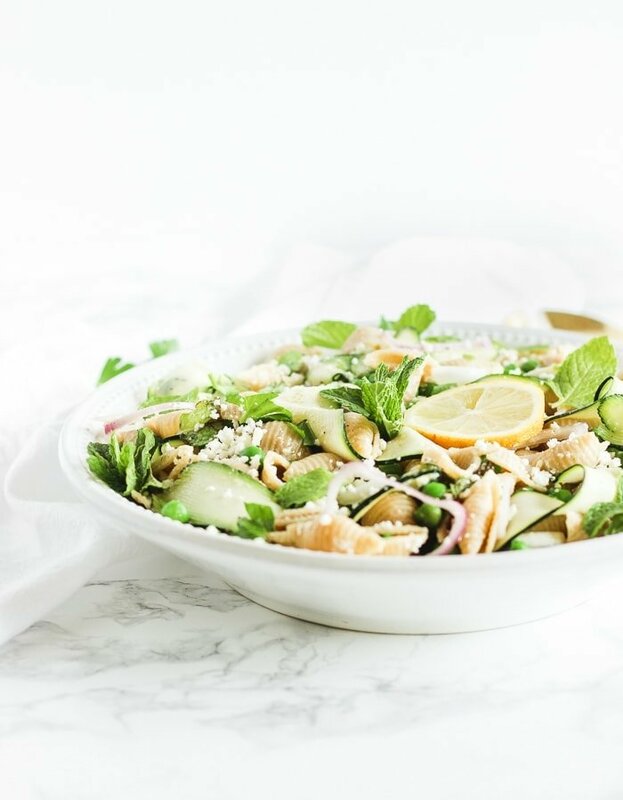 A bit of savory feta cheese, shallot and good olive oil balance out all the fresh flavors perfectly, while the whole wheat pasta adds some nice heft without being too heavy. We like to serve this pasta salad a side dish with any cookout classic, like burgers or BBQ chicken, but it’s also great with lighter entrées like fish. It’s also great all on its own for lunch – you can prep it ahead of time and take it to work with you for a few days. Here’s to hoping spring decides to show up soon. I’d really like to make a rhubarb recipe some time before fall! Prepare pasta according to package directions. Add peas in the last minute of cooking. Drain and cool. Use a vegetable peeler or mandoline to slice zucchini into very thin ribbons. 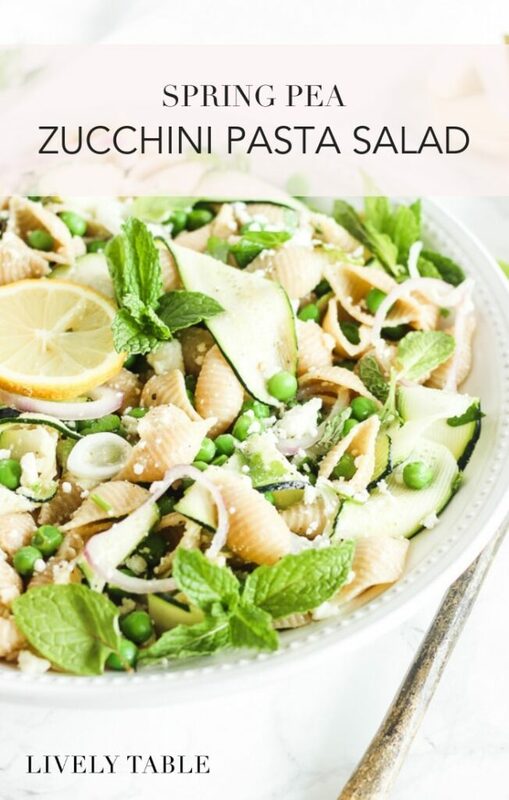 In a large bowl, combine pasta, peas, zucchini, shallot, mint, parsley, and feta. In a small bowl, whisk lemon juice, olive oil, salt and pepper. Pour over pasta and gently stir to coat.